This is the book most often taken as the starting point for novels illustrated with photographs. 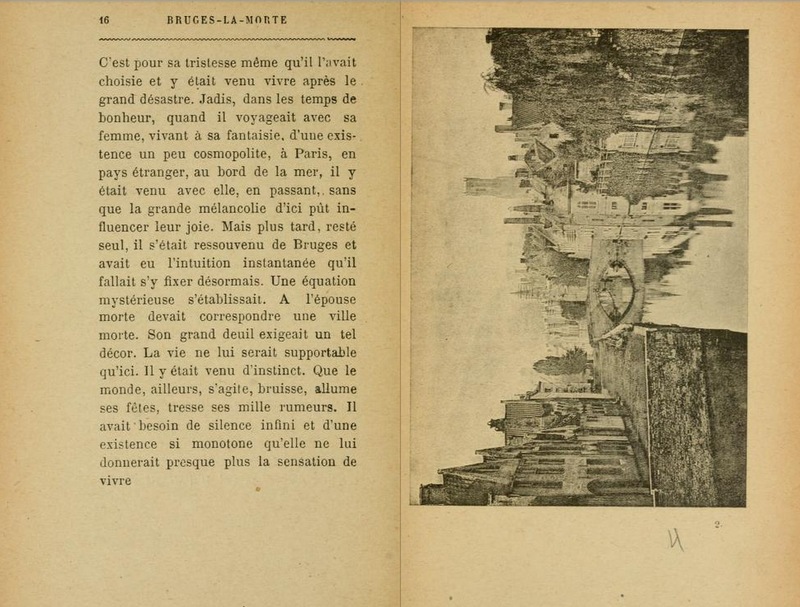 At the least, it could have supplied Breton with the idea of deserted streets for the novel Nadja, and it echoes in Sebald’s sense of wandering, anomie, and mourning. 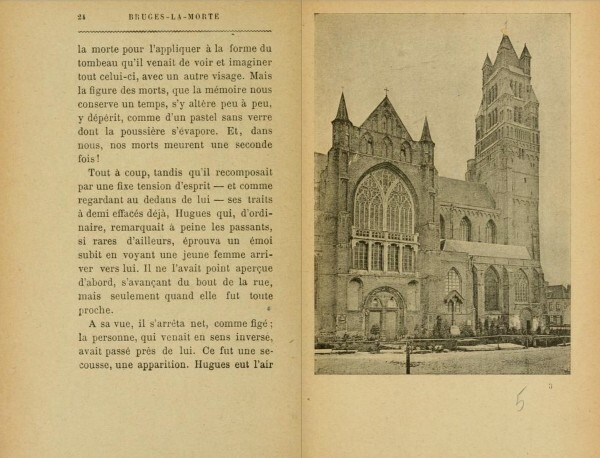 (Although it needs to be said there is no proof that Breton knew Rodenbach’s book in its original version, with photographs instead of drawings; see my remarks in the text on Breton.) There is a family resemblance of images and themes in Bruges-la-morte, Nadja, and Vertigo or Rings of Saturn: their relation is close for books separated—in the case of Sebald and Rodenbach—by over a hundred years. Even books like Orhan Pamuk’s Istanbul seem to show Rodenbach’s influence: Pamuk writes nostalgically about the yalıs, Ottoman wood-frame buildings that were still common in Istanbul when he was growing up, and he illustrates Istanbul with photographs of yalıs. Many images showing nearly or completely deserted streets and waterways, as in Breton, as in Rodenbach. Rodenbach’s influence is diffuse and not well understood, and for those reasons it is especially important to note exactly what happens in Bruges-la-morte, as opposed to just those things that were noticed and emulated, or echoed, by later writers. The full original is online at the Internet Archive, and it can be downloaded as a pdf. The illustrations have all been scanned online at Wikimedia Commons, from the Flammarion edition. 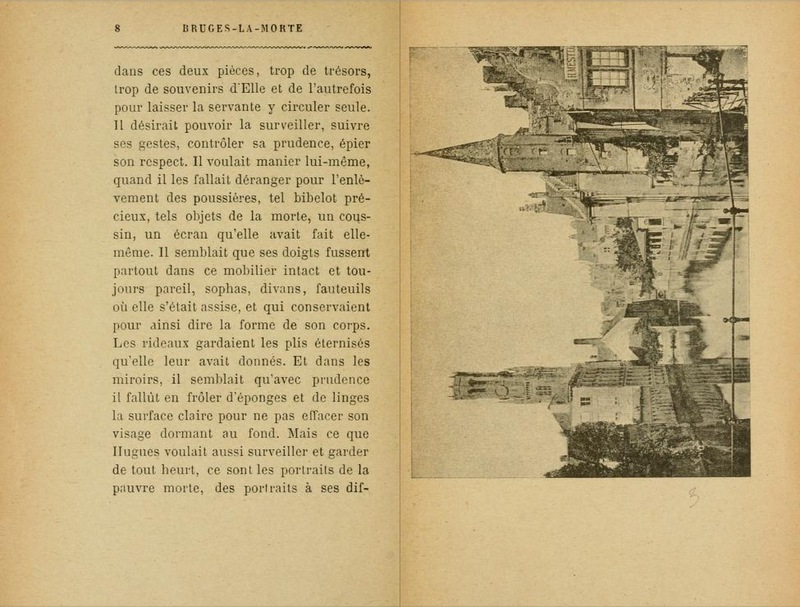 The original French text, without illustrations, is available in several places, for example as an e-book. Apparently there is no scanned online copy of an English translation other than the Will Stone version (see below). Magali Nachtergael showed me the page on the Répertoire de la Photolittérature Ancienne et Contemporaine site, which has a detailed history of editions of the book. Technically, the first edition was in Le Figaro; I refer to the first edition printed as a book. The best source is Paul Edwards, Soleil noir: photographie et littérature des origines au surréalisme (2008), 42-56, which goes into detail on the commercial sources of Rodenbach’s images, including retouching, re-uses of Rodenbach’s images, and the absence of clouds in the photographs. 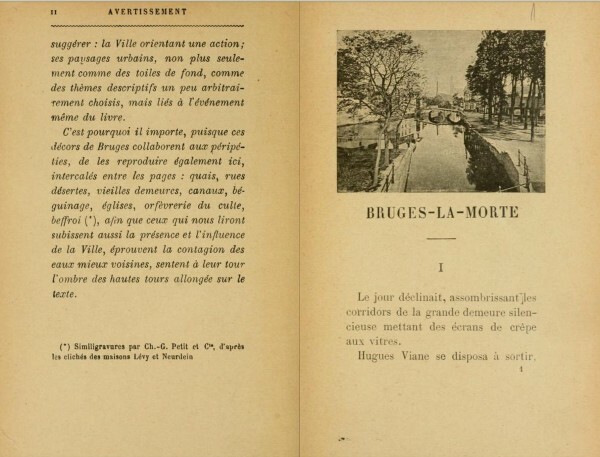 A short essay on Bruges-la-morte is also available in English. 1. The opening “Advertissement” ends with an invocation of “the pervasive presence of the waters” and “the shadow cast over the text by the tall towers” (“l’ombre des hautes tours allongée sur le texte”). The facing page has the first photograph of a canal. In the distance is a chimney and its reflection, and a church tower. 2. The second photograph is astonishing. It is the same view, but taken from about fifteen feet in front of the position the photographer stood for the first picture. Notice there are three trees on the left in the first photograph; the second was apparently taken next to the nearest of those three. Note, too, that these photographs were taken many hours or days apart: in the first, a tree on the right bank casts a shadow to the left; in the second photograph, one of the trees on the left casts a shadow to the right. In choosing these two images, Rodenbach may well have been after a particular effect of concentration. Perhaps he liked the way the second photograph revisits the first, in a more intensive fashion. Or maybe he meant to point readers toward some specific differences: the changed reflection of that second chimney, which shows clearly in the second photograph. 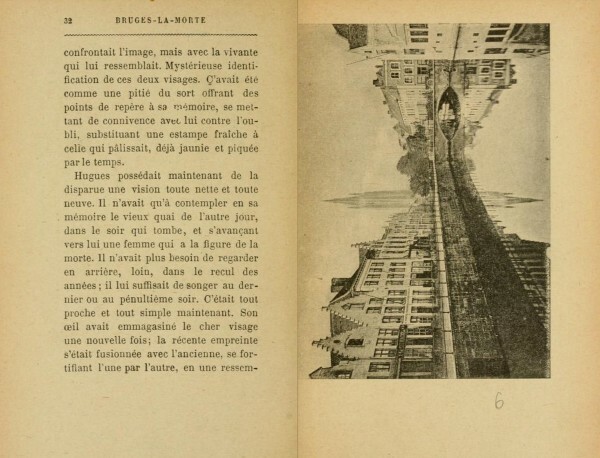 Whatever the sequence, and regardless of what he had his eye on, the pair is mesmerizing: the second photograph is given a vertical format and a full page, and it is placed opposite the first text in the book that proclaims the narrator’s intentions in walking the streets. 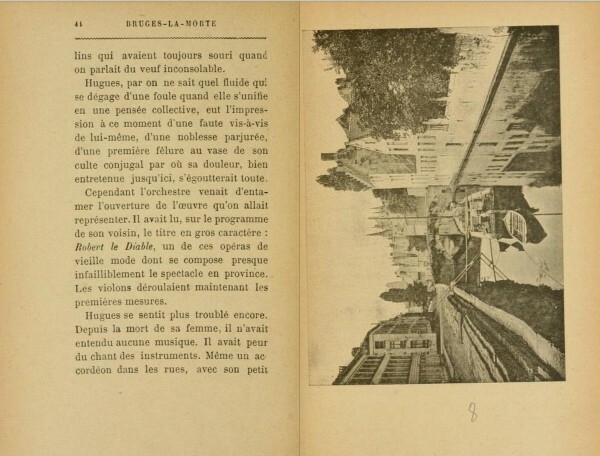 “As evening approached, he liked to walk, looking for analogies to his grief in deserted canals and ecclesiastical districts” (“Mais il aimait cheminer aux approches du soir et chercher des analogies à son deuil dans de solitaires canaux et d’ecclésiastiques quartiers”). It’s an irresistible pairing: I think it’s even possible that Rodenbach hoped readers would turn back and forth, comparing the two images, as he himself may have done when he was choosing them. Because we’re not told exactly what Hugues hoped to find, the reader’s search is also inconclusive: just as Hugues did not know where or how the image of his dead wife would appear in or as Bruges, so we, as readers, do not know what, exactly, we are meant to be discovering in this slightly off-register pairing. 4. The next image is arranged at the opening of chapter 2, when Rodenbach is writing about Hugues’s daily life. 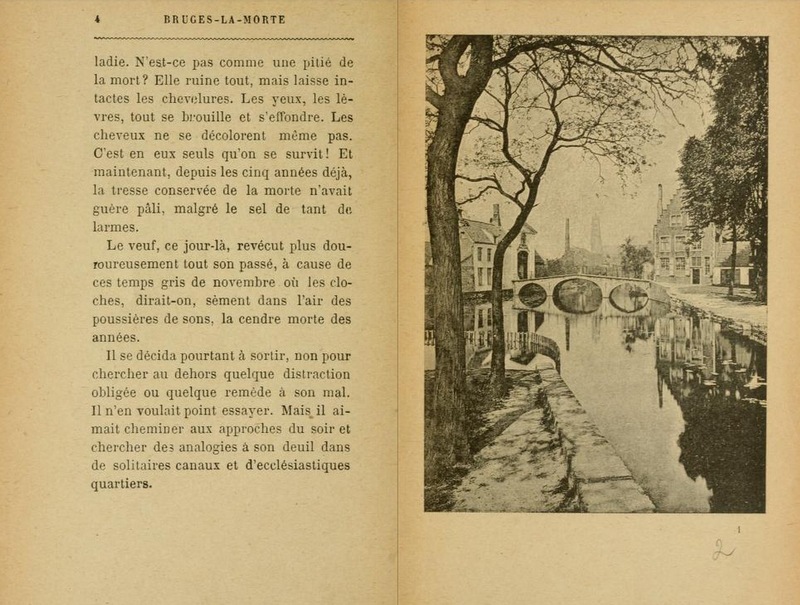 At the bottom of the page before this spread, we read: “And how melancholy Bruges was, too, during those late afternoons! 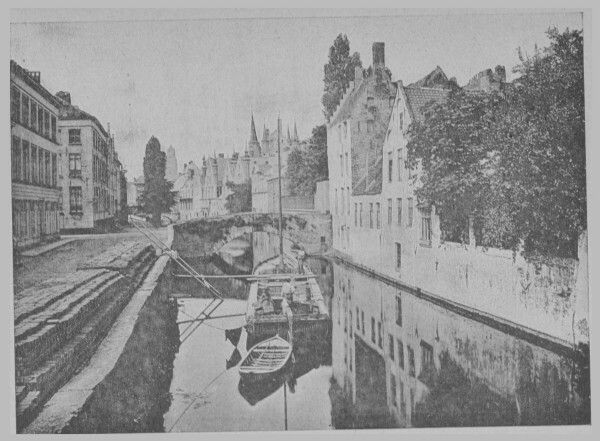 that was how he liked the town!” And then, on turning the page and seeing this photograph: “It was for that very melancholy that he had chosen it and gone to live there after the great disaster” of his wife’s death. (“C’est pour sa tristesse même qu’il l’avait choisie et y était venu vivre après le grand désastre.”) It is not likely Rodenbach chose that exact place for the page break, because every chapter begins the same distance down the page; but it is entirely likely he wanted this picture opposite that particular evocation of Bruges. This is the grandest, the most panoramic of Rodenbach’s images. It distills the town into water and towers, and at the same time gives the sense that it’s being represented whole, in its aspect—its “physiognomy,” to use a word I think Rodenbach intentionally avoided. 5. The next image is Notre-Dame, where Hugues has gone to see the tombs, and especially the effigies of Charles the Bold and Mary of Burgundy. It has been noted that Rodenbach probably couldn’t find a photograph in the church’s interior, so he used this photo instead. It is also possible that he preferred to keep Hugues’s encounter with the tombs private, or that he wanted to keep his images consistent with one another, perhaps so that they can equally conjure the narrator’s search. 7. 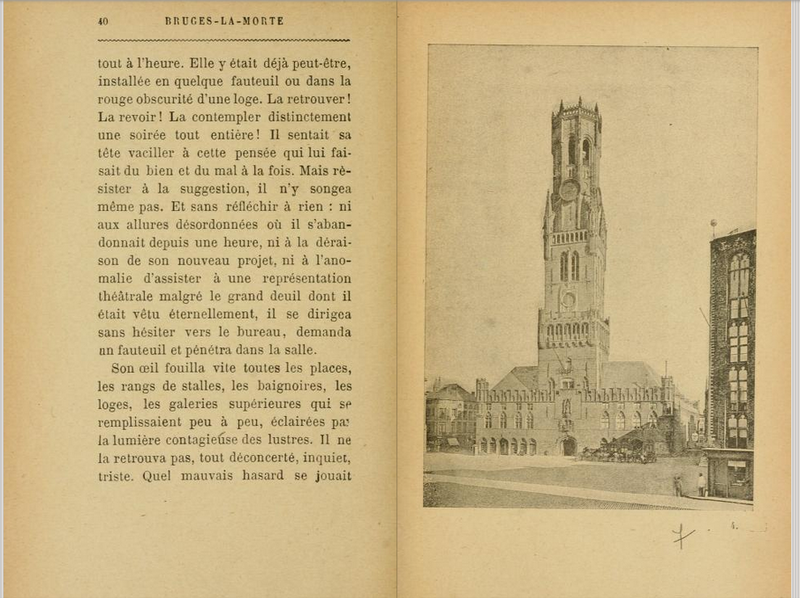 The next image comes some pages later; it illustrates “the center of the town, the Grand’Place where the tower of the old Market Hall (“Tour des Halles”), huge and black, was defending itself against the night with the golden buckler of its clock-face” (p. 38). Hugues has left “the deserted quais” and gone to the theater to see the woman he’s been following: it’s evening, and there are crowds, so the image doesn’t fit exactly. It also comes three pages after the mention of the location, after Hugues has already gone into the theater. A contemporary reader might miss the night scene; it’s likely Rodenbach couldn’t find a photograph of the square at night. 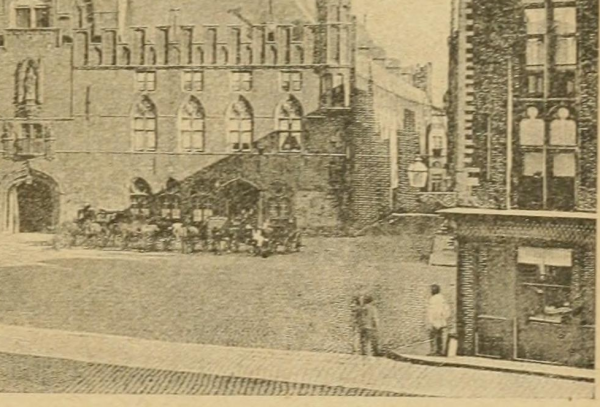 But he also chose not to use a photograph the square when it was crowded (assuming, that is, such a photo existed), so it is plausible that this image of a nearly deserted square in broad daylight was intended to have its own resonance with the crowded night scene in the text. It is consistent with the pictures of the city throughout the book: it is stark; its objects are distant, and that works well against the crowded scene in the narrative. The narrative here is still the scene in the theater, so this is the first image that is disconnected from the text. If we read attentively, it’s an interruption in the narrative, suggesting that in some measure the city remains the image of his wife, even while Hugues is searching for the lookalike in the theater. There are 35 photographs in the first edition, but I hope I have said enough to suggest that they repay a kind of combination of reading and looking that the book so far has not received. It’s not that every image is keyed to its immediate context—this last one isn’t—but rather that most of them are, and that the book repays a slow reading that moves from image to text and back. 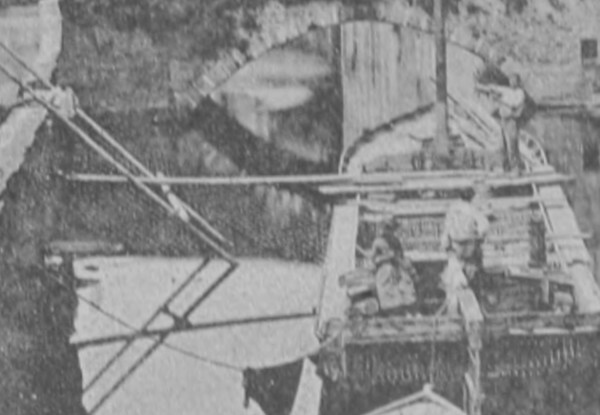 It wouldn’t have taken a magnifying glass to see two men and a woman on the boat, and a boy standing on what I take to be a pole for loading the barge. Three possibilities present themselves. Either Rodenbach did not expect his readers to look too closely at the images; or he didn’t think his readers would be distracted by scenes of the ordinary street life; or he meant the people in these images to be part of the narrative, the experience of reading of the book. I prefer the third alternative. In this case it is possible that Rodenbach chose the photo partly for its grouping of figures, and it is not unlikely that we are to imagine this as the sort of thing Hugues sees as he wanders around the city. The figures in the photos raise interesting problems for reading. In his mind, Hugues is disconsolate and utterly alone. 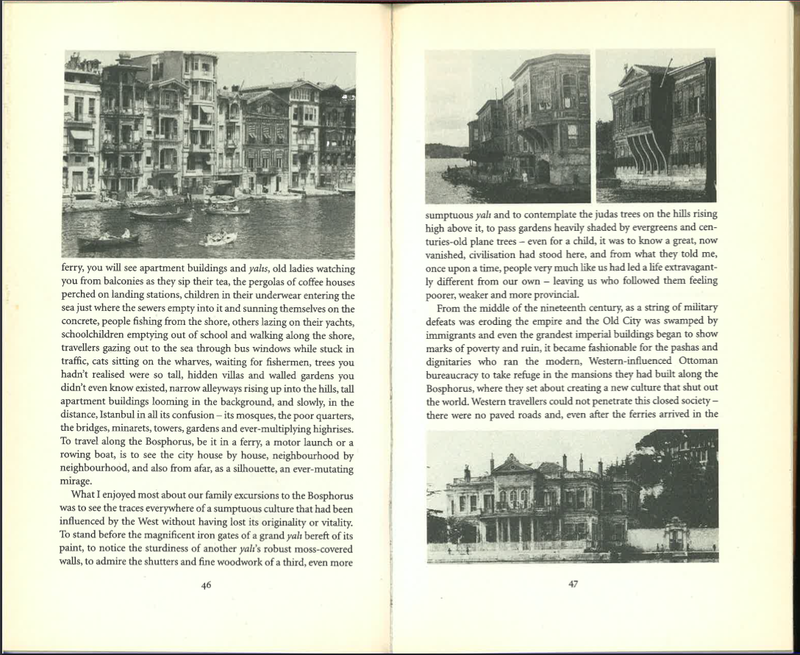 A reader who is asked to see the city through his eyes also sees these figures, and they become parts of the book’s narrative. But the narrator doesn’t mention them, and so they become spectral narratives, detached from the prose. They are an unusual kind of thing in literature, and I feel like they should have a name. A good name might be imaginary stories because they happen in images. If we notice them, they become figures Hugues would have seen, as it would then be as if the narrator did not think were worth mentioning. Perhaps they are also events we are to imagine Hugues did not register—they blended for him into the general categories of places that are “deserted,” and those with people who did not move or concern him. (A) The city is a character. This is what Rodenbach says, so it should be listed first. He means, partly, Hugues’s dead wife; but it is not clear whether he imagines “character” as something that develops—through a sequence of images—or as a single concept that can be mobilized repeatedly. (B) The photographs are a portrait, or other kind of representation, of Hugues’s dead wife. The city embodies her, so in this sense it is less a “character” than a portrait. In this sense every photograph is either part of a portrait, or—in a wonderful equivocation—all the photographs comprise a portrait. 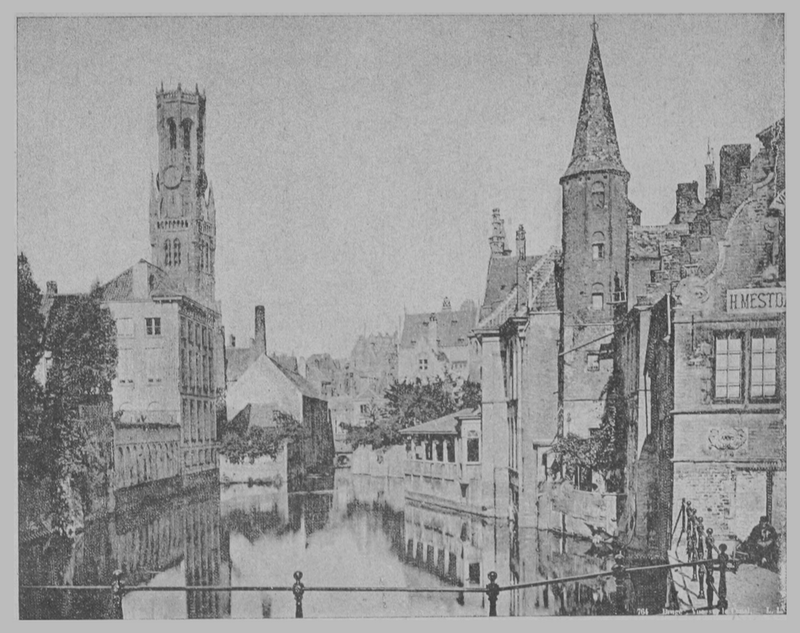 The portrait quality is especially clear in photographs with water, towers, or the main Bruges belfry. (D) The city is a photograph. In another interesting conflation, the city may also be a sequence of photographs. Edwards is good on this point, noting all the photographic metaphors Rodenbach uses to describe the city, “especially in chapters 6 and 11,” the two that were added for the first printed edition after the initial appearance in Le Figaro. The city has a “chemical atmosphere,” and is described in grays, blacks, and whites: it seems clear Rodenbach was writing an ekphrasis of photographs, and not of an actual city. (E) The photographs are of a city. This is what the narrative elaborates. The photographs seem most like documents of Bruges when we think of them as stock photographs chosen by Rodenbach, or when we notice—as Edwards does—that they were made with plate cameras with shifted bellows to ensure the verticals remain upright. (F) The photographs are of Hugues’s thoughts. This is also developed in the narrative, so it conflicts with the nominal realism of the photographs. The photographs seem most like images of Hugues’s thoughts when they are depopulated, and when we notice they are monochrome, ghostly, distant. As Edwards says, Hugues “does not distinguish between reality and his inner world,” his “internal landscape.” The ontology of the images—their reality, their mode of being—cannot be decided. For me the least interesting meaning is that the images are stock photographs chosen by the author. A more interesting possibility is that we are seeing the city as Hugues experiences it, drained of color and mostly of people. But the most interesting possibility is trying to think of these images as the contents of the narrator’s mind. That is a difficult trick for a novelist who writes with images, and I think the ambiguities I have listed her actually help keep that possibility alive. This provisional list of six meanings is remarkably wide-ranging, and I think Rodenbach’s book anticipates most of the principal ontological possibilities of meaning in later novels with photographs. 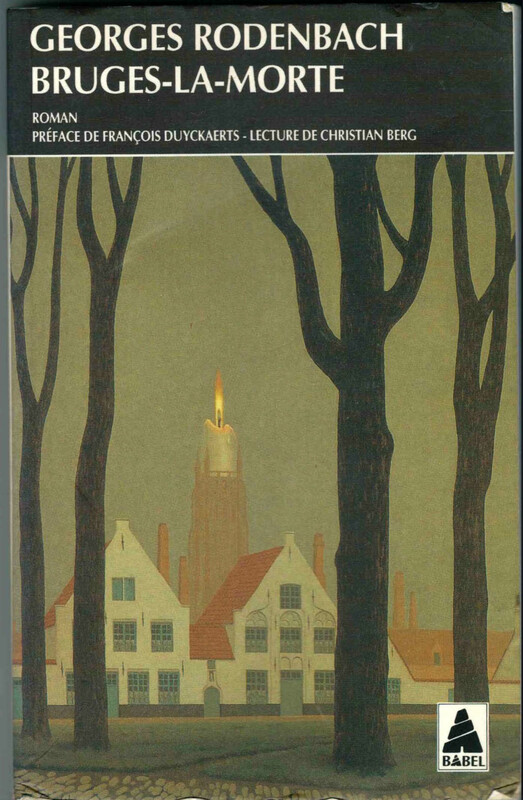 Like Tristram Shandy and other books that have been illustrated, Bruges-la-Morte has been reprinted and translated without its illustrations, and even with new illustrations. The carelessness and lack of concern for the visual—and the assumption that the photographs can be detached from the writing—may be characteristic of the history of the illustrated novel as a whole. Yet the editors do not even mention the images in Rodenbach’s book, and they interrupt Rodenbach’s own novel to insert photographs of himself, his family, and his letters! The recent English translation by Will Stone poses a special problem for this project. Stone, a translator and poet, supplied the book with 23 new photographs and omitted all of Rodenbach’s. In only learned this after I read the book, from a film documentary. It is strange and irritating that the English translation doesn’t tell readers that the images are new, and even odder and more annoying that Stone says he asked his publisher to use the 23 new photographs in order “to show how little has changed.” But how can readers appreciate that if they aren’t told the photographs are new? 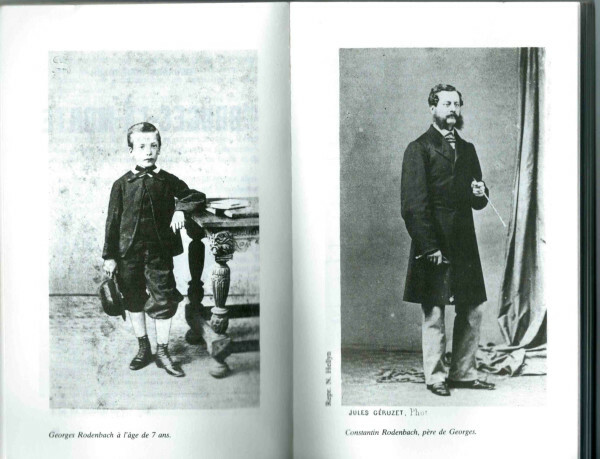 And if “little has changed,” why not use Rodenbach’s original photographs? And why spend time translating one of the seminal novels with illustrations if its illustrations mean so little? (But not so little that it isn’t worth re-photographing them?) And what assures readers that Rodenbach’s original images can be omitted without altering the book? Stone says that he took the photographs, including one of the house where Rodenbach’s character Hugues is said to have lived, before he even read the book. But after having read it, and helped to translate it, how could he think that the original is so independent of its images that they can be deleted and replaced by others intended simply “to show how little has changed”? For me that blindness casts doubt on the entire translation as well as Stone’s photographs. Fascinating piece, Jim. Fittingly, Frank Corsaro’s production for NYCO of Die tote Stadt, based on this novel, is often referred to as the first operatic staging to incorporate film images into the mise en scene. (Berg’s Lulu was going something different. )I saw it several times over the years but don’t recall the program notes explaining the novel’s original deployment of photographic images. Bill, thanks. I’ve never seen Die tote Stadt. I’m wondering if this entire theme of the dead city might have become a little too easy; it’s one of my misgivings about Sebald. I remember an essay by one of my teachers, Reinhold Heller, called “The City is Dark,” on the German expressionist origins of the dead city. Thanks for that! It’s a beautiful scan, with Rodenbach himself as its only illustration! In the light of your final comment about the Will Stone translation, I particularly draw your attention to the astonishing editorial comment at the start of the Duncan translation, where Duncan says that he omitted the photos “as they do not appear to succeed in conveying the imaginative impression intended by M. Rodenbach” – despite Rodenbach’s clear statement that his intention is that they be integral to the book. See also the site bruges-la-Morte and particularly chapter 23 of my study “Le secret de Bruges-la-Morte” in French.